This stylish, contemporary 2nd floor apartment is ideally located in the heart of Glasgow's city centre, within 100meters of St Enoch Square and the landmark St Enoch Centre. Located on the 4th floor, with lift access, it is close to key rail, bus and underground travel terminals, all within a short walking distance. The apartment comes with two double bedrooms, an open plan kitchen/lounge area and has a fantastic view over the river clyde. All fixtures are modern and fitted to the highest standards. Furnishings and layout give emphasis to comfort and usability, complimenting rather than compromising on the overall style which is one of contemporary opulence. A welcome pack awaits you on arrival. Broadband internet access is also provided. The bathroom comes with a fitted bath unit with an overhanging shower. Throughout the apartment there is an abundance of storage areas including wardrobes and cupboards. It also benefits from a secure entry / telecom system and is part of a respectable, well-maintained, and highly secure apartment complex. Domestic fixtures and appliances include flat-screen Television, microwave oven, gas cooking hob, kettle, central heating, lamps and stylish lighting throughout, and much more. 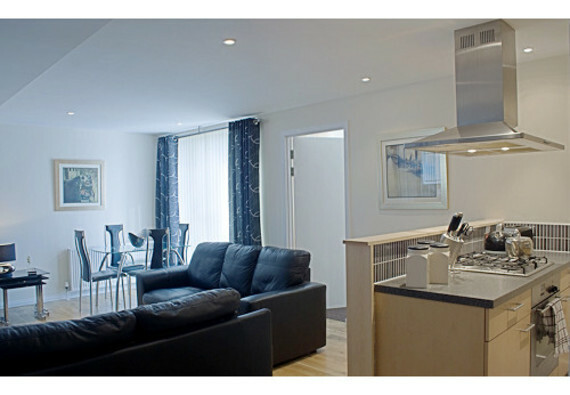 The apartment was light and attractive with a view over the Clyde. It was spotlessly clean with new towels in the bathroom. The grouting round the bath let down the appearance of the bathroom, which was a shame. The kitchen was pretty but would benefit from being equipped with wooden spoons, sharper knives and a small chopping board. Apart from these niggles we enjoyed our stay. The neighbours were very quiet, the beds were very comfortable, as we're the couches in the living room. Happy with services will recommend and will book again.